Pucker up bark is a sweet and sassy chocolate bark recipe, perfect for Valentine's Day! 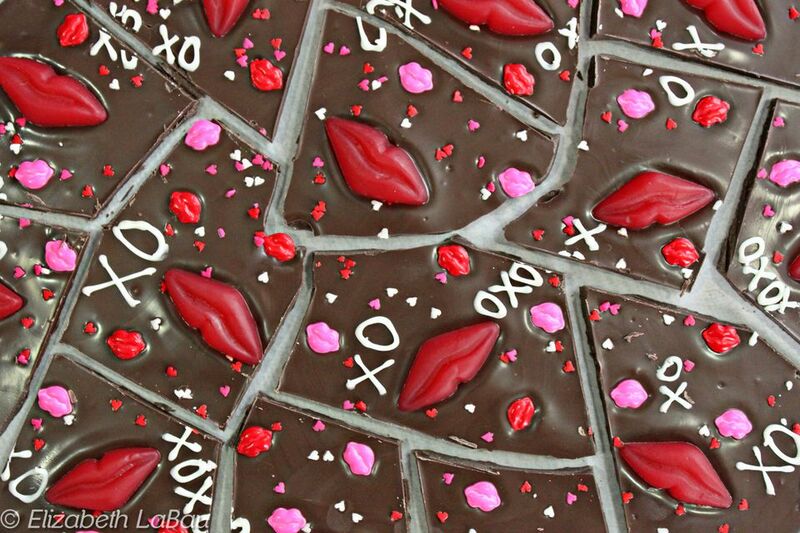 Dark chocolate is studded with candy lips and cute XOXO's. Cover a baking sheet with waxed paper or parchment paper. Place the chocolate candy coating in a microwave-safe bowl, and microwave in 30-second increments, stirring after every 30 seconds. Pour the coating out onto the baking sheet, and smooth it into an even layer about 1/4-inch thick. While the coating is still wet, place the gummy lips all over the top of the bark. Press down gently to embed them in the chocolate. Scatter the candy lips around, then finally add the small sprinkles to fill in any gaps. Melt the white coating in a small bowl. Transfer it to a paper cone or a plastic bag with a hole cut in the tip. Draw "xoxo" or your messages of choice on top of the bark with the white coating. Refrigerate the tray to set the bark, for at least 25 minutes. Once set, break the break or cut the bark into pieces. Store in an airtight container at cool room temperature for up to 2 weeks.